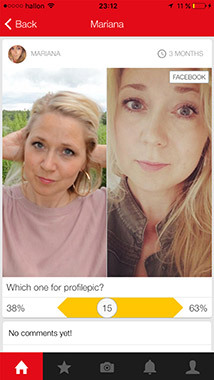 Is your profile pic the right one? Today most of us are on social media and often the only info others have about us might be a profile picture. We know that your online photos will either open doors or close them. 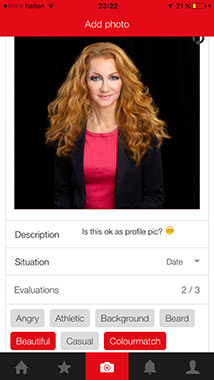 But what does your photos say about you? Well, your whole personality can be judged from one single photo. Wouldn't it be helpful to get an honest answer. Like from a kind, trusted friend? 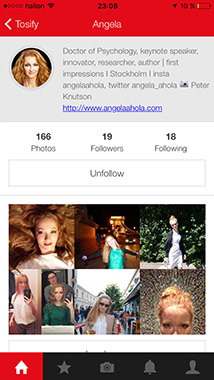 Tosify® is the app that gives you instant and honest feedback on all your pics. The right photo makes all the difference. Take control of what your pics say about you. Thousands of others already do. Let us help you make the impact they'll never forget. Can you take the truth? Instead of asking your friends and family Tosify® will give you the honest truth about how others see you. No more, no less. Tosify® was created by a highly innovative and international team lead by doctor, entrepreneur and first-impression expert Angela Ahola. The idea was born out of Angela's own psychological research within impression formation and person perception. - "Fast, intuitive judgments are necessary for us to be able to manage our environment. We’re constantly drawing conclusions about each other, whether we like it or not, based on a number of factors that we seldom are fully aware of. Within milliseconds others have formed an opinion about who you are? Friend or foe? Dumb or smart? Leader or underdog? With the push of a button, we now can keep track of how others perceive us, from day to day" Angela says. I used to wonder: Does my Tinder profile pic increase or decrease my chances of finding someone new to date? What about my LinkedIn pic? Thanks to Tosify, it's so much easier now to find out how others really see me in a particular photo! I often find it really tricky deciding which outfit to get. Now I just go ahead and try it on, snap a photo (in the dressing room), and upload it onto Tosify. In a few moments I get feedback on what others think looks best on me. Easy! Curly or straight hair? Bangs or not? What colours suit me best, and which makeup style? What should I wear to the night club? Thanks to Tosify, my everyday decisions are so much easier now. And I have fun getting inspired by others' pictures in Tosify!